Get reliable readings of your body temperature from baby to adulthood. Taking temperature of children with old-school thermometer is difficult, but now, it's easy and quick. Measuring Forehead Temperature: Press Forehead mode button, touch and scan forehead from temple one side to the other and then release the button. Measuring Eardrum Temperature: Take off the probe cover, insert the sensor into the ear canal. Then press the Ear mode button and you will hear a beep signaling when temperature is taken. Children under 1 year: Pull the ear straight back. Children aged 1 year to adult: Pull the ear up and back. ºC/ºF Setting: Press Ear button for 8-12seconds under shutdown state, and the temperature unit shifts automatically. Press Ear button within 5 seconds after release to change ºC/ºF, then wait for the product to start up. The Dual mode infrared thermometer is not waterproof. It can only be used for body temperature measurement. An ear (tympanic) temperature could be 1-2°F (0.6-1.2°C) higher than forehead skin temperature. This is NOT due to the inaccuracy of the thermometer. 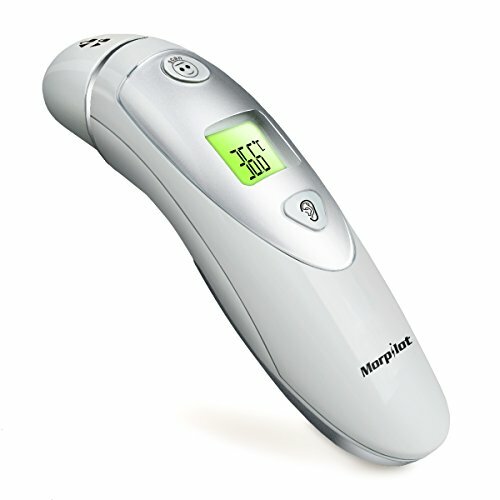 DUAL MODE - Measure temperature via forehead (suitable for all ages) or ear (recommended for children above 3 months). QUICK AND ACCURATE - One second measurement time. Clinically tested and proven to be reliable and more accurate in new version. FEVER WARNING - Audible and visual fever warning alert when the reading exceeds 37.5℃/99.5℉. MEMORY RECALL - Store and recall the last 20 past measurement results for record analysis. HYGIENIC AND PROFESSIONAL - Recommended thermometer by doctor and pediatricians. CE Approved. Easy to clean and maintain.